The Vienna International Centre (VIC) or ‘UNO City’ was designed by the Austrian architect Johann Staber and inaugurated on 23 August 1979. It is located on the banks of the River Danube, only a 10 minute ride by underground (U-Bahn) to the city centre. The Austrian Government is leasing the building for 99 years to the International Atomic Energy Agency (IAEA) and to the other United Nations and international organizations in Vienna at a symbolic rate of €0.07 per year. 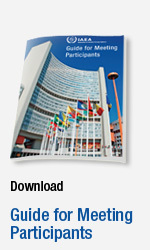 In addition to the IAEA, the VIC accommodates other United Nations and international organizations, which are listed at the end of this booklet. The VIC comprises several buildings, labelled A to Q. Buildings A and B house the IAEA. Building M is the main conference building. Buildings D and E house UNOV, UNIDO, CTBTO and other UN entities, and buildings F and G house various IAEA support services such as the computer centre, the print shop, the medical centre and the library, as well as the VIC restaurant. The official address of the IAEA is: International Atomic Energy Agency, Vienna International Centre, PO Box 100, 1400 Vienna, Austria. The VIC can be reached with the U-Bahn by taking the line U1 (marked in red on city maps) towards Leopoldau and getting off at the station Kaisermühlen-Vienna International Centre. Single tickets, multiple tickets for 2, 4 or 8 rides or for 1, 3 or 8 days, and weekly tickets can be purchased from vending machines in all U-Bahn stations or at tobacco shops marked Tabak Trafik, and also at the VIC newspaper stand located in building G. The weekly ticket is valid Monday through Sunday with unlimited use of all Viennese public transport facilities (U-Bahn, bus, tramway, S-Bahn (Schnellbahn)). As all participants will have to go through the registration formalities, passengers should ask the driver to drop them off at Wagramer Strasse 5, Gate 1. For departures, a taxi may be requested at Security Services, Gate 1. An additional fee is charged for taxis ordered by telephone. The customary tip in Austria for taxi drivers is 10% of the fare. Please note that there may be an extra charge for luggage, which is not shown on the meter. The Vienna Airport Lines operate seven days a week, at hourly intervals, from 6:10–20:10. The VIC bus station is located on Wagramer Strasse in front of Gate 1. The trip takes about 30 minutes. There are two options: First is the S-Bahn (Schnellbahn) from the airport to the City Air Terminal located next to the Hotel Hilton. The S-Bahn leaves approximately every 30 minutes. The trip takes about 25 minutes. After arriving at the City Air Terminal, change to the underground line U4 and then U1 (see info listed under public transportation) to get to the VIC. The second option is the City Airport Train (CAT), linking the airport with the City Air Terminal. The trip takes about 16 minutes (passenger fare is €9 for a single ticket and €16 for a return ticket). For further information, please visit: www.cityairporttrain.com and www.tripadvisor.com. IAEA meeting participants should arrive at the VIC one hour before the start of the meeting on the first day, in order to allow sufficient time for registration and issue of grounds passes. Upon arrival at Gate 1, meeting participants are requested to identify themselves with their national passport or a valid official identification document at the IAEA registration desk. Meeting participants should bring their invitation letter to facilitate the check-in process. Unannounced meeting participants or visitors will only be admitted to the VIC if they can produce evidence of the purpose of their visit or an invitation letter from the IAEA. The UN Pass Office will issue a grounds pass with photo. Please note that it is mandatory to wear the grounds pass visibly at all times while on the VIC premises. In the case of an unannounced arrival, the UN Security and Safety Service needs to obtain confirmation of participation in a meeting. This may delay the registration process. Meeting participants who have special requirements should notify the Scientific Secretary of their meeting or the Conference Services Section in advance about the kind of assistance they require. Based on the information received, these will make the necessary arrangements with the UN Security and Safety Service. Persons with physical disabilities (permanent or temporary) that would exclude them from active participation in an evacuation of the premises are requested to notify the UNSSS at the time of registration for a meeting. In the event of an emergency evacuation, those persons will be attended to by staff assigned by the floor’s Evacuation Officer/ Scientific Secretary (if appropriate), or by UNSSS personnel. The Security Control Centre is equipped with a public address system within the different buildings, in the park decks and on the plaza. Should an emergency situation arise requiring a general (all areas) or partial (selected buildings) alarm, the appropriate announcement — starting with the word “attention” — will be made by UNSSS. All persons within the premises must pay attention to such an announcement and follow the given instructions. -Follow the advice of your Scientific Secretary/Technical Officer or Conference Services staff/UNSSS personnel and evacuate the area via the nearest emergency exit. Public assembly areas both within and outside the VIC premises have been designated by UNSSS and will be made known, as the situation requires. WHERE - Give the exact location of the emergency. WHAT - What is the nature of the emergency (e.g. fire, medical)? Are there any persons in imminent danger? Report on injuries in addition to any other relevant details. WHO - Give your name and room number and stay on the telephone line until the security officer ends the call. Answer the Security Officer’s questions to the best of your knowledge; keep to the facts (no guesses/assumptions). Do not hang up: the Officer will terminate the call! In case of a crisis of any nature (e.g. fire, terrorist attack, health epidemic) at the VIC, the Agency has developed an Agency-wide crisis recovery plan. Evacuation of the VIC would be coordinated by the United Nations Security and Safety Service, but the IAEA Crisis Recovery Team would subsequently need to be able to account for all staff and meeting participants in the VIC. Please do not try to contact the IAEA by phone, as phone lines need to be kept as free as possible. Meeting participants should check the IAEA website (http://www.iaea.org) regularly in the aftermath of a crisis to get the latest information on current and future meetings. To the extent possible, the IAEA will subsequently contact meeting participants by email or by phone to provide updated meeting information. We would request you not to talk to the media. Any media inquiries should be directed to the IAEA Crisis Management Group. If you were evacuated from the VIC in the aftermath of an incident likely to result in contamination of any kind, avoid close contact with other individuals to the extent possible and administer self-decontamination (thorough full body wash, seal contaminated clothes in an air-tight containment) at the earliest possible stage. If you experience any post-incident medical issues, proceed to the nearest hospital forthwith or, in severe cases, call the national medical emergency service number 144. General information on the VIC, the IAEA and Vienna, as well as other information material and maps are available in building M (ground floor). Bank Austria has two branch offices in the VIC. One branch office is located in building D on the ground floor (D0E71), external telephone no. : 050505-30200, fax no. : 050505-30205, internal extension: 4988+30231, email: vic@ba-ca.com. Another branch is located in building C (level 1, C0113), external telephone no. : 050505-30200, fax no. : 050505-30210, internal extension: 4988, email: vic@ba-ca.com. Opening hours are 9:00–15:00 (17:30 on Thursdays). Bankomat (ATM) machines are available outside the bank on D0E71 and C0113. The United Nations Federal Credit Union is located in building C first floor, external telephone no. : 26060 5753, fax no. : 26060 5870, internal extension: 5751, email: lzeiml@unfcu.com. Opening hours are 8:30–16:00 (17:00 on Thursdays). The VIC post office is located in building C, first floor. Opening hours are 8:00–18:00, Monday to Friday. The internal extension is 4986. The official telephone number of the IAEA is: +43-1 2600 plus the extension. If the extension is unknown, dial 0 for the IAEA switchboard. Telephones are available in all meeting rooms which may be used for internal and local calls. For internal calls lift the receiver and dial the required extension. For local (Vienna) calls lift the receiver, press 0 and dial the desired telephone number. Long distance calls can be made from the post office. American Express is the official travel agency of the IAEA. It offers travel services for both official and private travel. It is located on the ground floor of building F (F0E03), external telephone no. : 2600-23070, fax no. : 2600-23050, internal extension: 23060, email: iaealeisure@aexp.com. Opening hours are 8:30–17:00, Monday to Friday. Carlson Wagonlit is located in building F (F0E11) and is also available for private travel, external telephone no. : 26026-3186, internal extension: 3186, email: unleisure@carlsonwagonlit.at. Opening hours are 9:00–17:00 (15:00 on Wednesdays). The VIC Cafeteria is located on the ground floor of building F and offers a variety of hot and cold dishes, snacks and drinks. Opening hours are 7:30–10:00 and 11:30–14:30. The Coffee Corner in the VIC Cafeteria is open 8:00–15:30. The VIC Restaurant is located on the ground floor of building F. Opening hours are 11:30–15:00. Table reservations can be made from 9:30 by dialing internal extension 4877. Coffee bars are located on the ground floor, 1st and 2nd floors of building M. The coffee bar on the 1st floor is open daily 9:00–16:00. The opening hours of the coffee bar on the 2nd floor correspond to the planned coffee breaks of meetings held on this floor. The Coffee Shop (UNO Café) at Gate 1 is open daily 8:00–18:00. The Cocktail Lounge is located on the ground floor of building F. Opening hours are 11:30–15:00 and 16:30–20:00. The VIC Medical Service is located on the 7th floor of building F (F07). Opening hours are 8:30–12:00 and 14:00–16:30 (15:00 on Thursday). Emergencies, however, are dealt with at any time during regular office hours. The internal extension is 22223. In case of emergency, dial 22222. The Pharmacy is located on the 7th floor of building F (F0715). It sells over-the-counter and prescription drugs. Opening hours are 10:00–12:00 and 12:30–16:30. The internal extension is 21599. Sales publications are exhibited in the corridor between buildings A and M and may be purchased at reduced prices from the Documents Distribution Unit, which is located on level minus 1 of building F (F–152). The internal extension is 22477. Should photocopies of technical documents be required in the course of a meeting, please go to the Click & Copy Service, which is located in building M on the ground floor (M0E74). It is open during regular office hours. The IAEA Library is at the disposal of all meeting participants and visitors. It is located on the first floor of building F (F0146). The library has scientific publications, newspapers, journals, audiovisual material, documents and technical reports. A reading room and PCs are also available. Opening hours are 9:30–17:00. The internal extension is 22620. The UN Security Service Duty Room on the ground floor of Building F (F0E21) provides a “lost and found” service. The extension is 3903. The Vienna Service office is located on the ground floor of building C (C0E14). This office provides information about sightseeing tours in and around Vienna. Opening hours are 8:30–13:30, Monday to Thursday. The internal extension is 4234. The newspaper stand sells a wide array of international newspapers and magazines, books and tickets for the public transport facilities. It is located on the ground floor of building G (G0E82). Opening hours are 8:00–18:00 (7:30–16:30 in summer). A flower shop can be found at Gate 1. Opening hours are 8:30–18:00. The external telephone number is 263 76 53. A dry cleaning service can be found on the ground floor of building G. Opening hours are Monday to Friday 11:30–15.00. The internal extension is 22484. A hairdressing salon is located at Gate 1. Opening hours are 9:00–19:00. The external telephone number is 263 6060. The IAEA souvenir counter is located on the ground floor of building A. Opening hours are 12:00–14:00 (Tuesday and Thursday only). The official United Nations Gift Counter is located at Gate 1. Opening hours are 10:00–16:00, daily. The sales counter of the United Nations Postal Administration offering stamps and souvenirs is located at Gate 1. Please note that mail with UN stamps can only be dispatched from the VIC. Opening hours are 9:00–12:00 and 13:00–16:30. The internal extension is 5243. The UNICEF counter is located at Gate 1. Opening hours are 12:00–15:00 Tuesday to Thursday, 12:00–14:00 on Friday. The internal extension is 21306. United Nations Women’s Guild Gifts The United Nations Women’s Guild is located at Gate 1. It offers gifts and donates the profits to children’s charities around the world. Opening hours are 12:00–15:00. The internal extension is 21313. Time Zone Austria follows Central European Time. Electricity The electricity voltage is 220 volts (50 cycles). A standard voltage converter and an adapter should be sufficient for conversion. Normally, the electricity outlet in Vienna requires a two-prong plug with round prongs. Computers require a European plug adapter and phone jack adapter that can be purchased at appliance stores. Shopping in Vienna Shops are generally open from 9:00–19:00 on weekdays and from 09:00–18:00 on Saturdays. Shops are closed on Sundays, except for supermarkets at railway stations, some U-Bahn stations, and the airport. Hotels Information on hotels offering discounts for IAEA meeting participants can be found on the website for IAEA meetings under “General Information”.The information contained in this brochure was compiled by the Conference Services Section, Division of Conference and Document Services.